Phase locked local oscillator and a highly reliable high power amplifier. 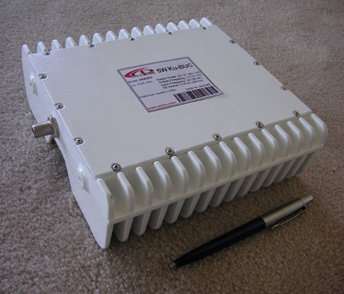 It converts L Band (950 to 1,525 MHz ) IF input to C Band (5.850 to 6.425 GHz) RF output. This outdoor RF unit transmitter can be used for DAMA, two-way data and rural telephony systems. Conversion gain 56 dB nom. Size & Weight 267.5 mm (L) x 122 mm (W) x 58 mm (H), 2.5 kg max.